Zo'n vijftien procent van de raketten die terroristen in de Gazastrook afschieten komt binnen de Gazastrook zelf terecht, maar gemakshalve worden alle omgekomen Palestijnen aan Israel toegeschreven. Soms zijn daar kinderen bij wiens foto's de wereld rond gaan, zoals het dode kind dat door de Egyptische minister werd gekust tijdens diens bezoek in november. Ook het dode kind van een Palestijnse journalist werd wijd verspreid. Deze foto sprak waarschijnlijk mede aan in het Westen omdat het een BBC-journalist betrof, die ook nog eens meer als een Europeaan oogde dan als een Palestijnse moslim. Elder of Ziyon (zie derde artikel onderaan) was de eerste die opmerkte dat ook dit kind niet door een Israelische raket kon zijn omgekomen maar waarschijnlijk door een Palestijnse. Toen dit recent werd bevestigd in een rapport van de VN, pikten ook verschillende media het op en zetten hun eerder klakkeloos van Palestijnse bronnen overgenomen bericht recht. Previous reports indicated that the baby of a BBC reporter in Gaza was killed in an Israeli airstrike; UN office of the High Commissioner for Human Rights says in new report that incident likely caused by errant Palestinian rocket. An errant Palestinian rocket, not an Israeli airstrike, likely killed the baby of a BBC reporter during fighting in the Hamas-ruled territory last November, a UN report indicated, challenging the widely believed story behind an image that became a symbol of what Palestinians said was Israeli aggression. 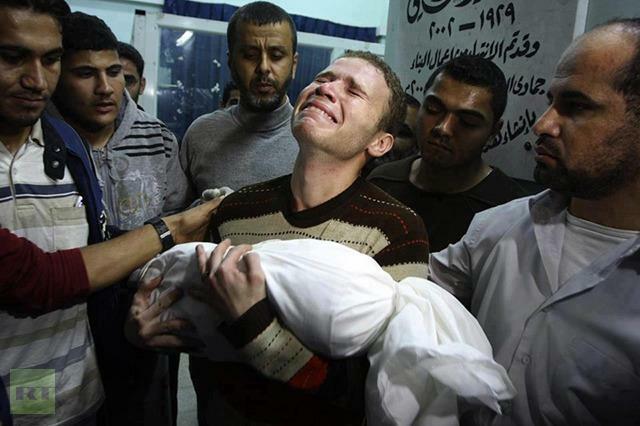 Omar al-Masharawi, an 11-month-old infant, was killed on Nov. 14, the first day of fighting. An Associated Press photograph showed Omar's anguished father, Jihad al-Masharawi, clutching his slain child wrapped in a shroud. Palestinians blamed Israel, and the image was broadcast around the world and widely shared on social media. Now a report from the UN office of the High Commissioner for Human Rights says the baby was "killed by what appeared to be a Palestinian rocket that fell short of Israel." Gaza's rulers, the militant Islamic group Hamas, whose fighters fired most of the rockets into Israel during the conflict, had no response Monday. BBC officials had no immediate comment, and Jihad al-Masharawi said he couldn't discuss the issue. An Israeli military spokesman said they could not confirm or deny whether they hit the al-Masharawi house. Matthias Behnke, head of OHCHR office for the Palestinian territories, cautioned he couldn't "unequivocally conclude" that the death was caused by an errantly fired Palestinian rocket. He said information gathered from eyewitnesses led them to report that "it appeared to be attributable to a Palestinian rocket." He said Palestinian militants were firing rockets at Israel not far from the al-Masharawi home. Behnke said the area was targeted by Israeli airstrikes, but the salvo that hit the al-Masharawi home was "markedly different." He said there was no significant damage to the house, unusual for an Israeli strike. He said witnesses reported that a fireball struck the roof of the house, suggesting it was a part of a homemade rocket. Behnke said the type of injuries sustained by al-Masharawi family members were consistent with rocket shrapnel. 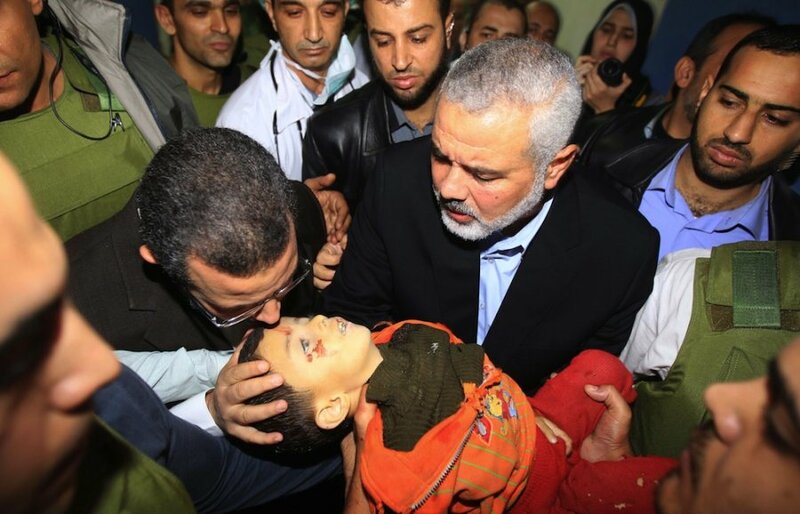 The Gaza-based Palestinian Center for Human Rights said it still held Israel responsible for Omar's death. The PCHR has condemned Hamas fighters and other militants in the past for errantly-fired rockets that have killed Palestinians, including during the November clash. A researcher said the group interviewed family members, neighbors and security officials before they concluded that an Israeli strike killed the baby. She requested anonymity because she wasn't authorized to speak to reporters. The baby was killed hours following the eruption of fighting after Israel killed a top Hamas militant leader in an airstrike, in response to incessant rocket fire by Palestinian militants in Gaza. Israel carried out hundreds of airstrikes, saying it targeted militant centers and fighters in Gaza. Palestinian militants indiscriminately fired hundreds of rockets and mortar shells toward Israel. During the 8-day conflict, about 160 Palestinians and six Israelis were killed. The UN report did not name the al-Masharawi family in its one-sentence statement about the incident. Behnke, the UN official, said the report referred to the incident. The report discussed the incident in the context of Palestinian militants disregarding civilians, both by firing rockets from crowded Palestinian areas and by aiming them indiscriminately into Israel. In the same report, the authors also criticized Israel for appearing to disregard civilians while pursuing militants and military targets, and for targeting civilian sites, like hospitals, bridges and media offices. Among many cases, they noted an 84-year-old man and his 14-year-old granddaughter were killed by an Israeli military strike on Nov. 21 while they were in their olive orchard on Gaza's eastern border. They also cited an Israeli airstrike on a crowded Gaza City neighborhood that killed 12 people, including five children and four women. The UN Human Rights Council released an advanced version of its report on Israel’s November conflict with Gaza terrorists this week. The report is unusually fair to Israel, and disputes several claims made by Western media against Israel during Operation Pillar of Defense. Most significantly the report says that in all likelihood the 11-month-old child of a BBC employee Jihad Misharawi was killed during Operation Pillar of Defense by Hamas rocket fire rather than by Israel, the side initially blamed in reports by the BBC and several other media outlets covering the conflict. The footnote (69) says the case was monitored by the UN OHCHR, meaning that the UN itself investigated this case and believes that the attack came from a Hamas rocket. The UN Human Rights Council released an advanced version of its report on Operation Pillar of Defense. In some cases, more information would be required to make a more specific assessment.Based on the information available to OHCHR, the IDF did not consistently uphold the basic principles of conduct of hostilities, namely, the principles of distinction, proportionality and precautions. Further, the effectiveness, sufficiency and adequacy of precautions taken remains questionable in several cases. One example given is notable. On 14 November, a woman, her 11-month-old infant, and an 18-year-old adult in Al-Zaitoun were killed by what appeared to be a Palestinian rocket that fell short of Israel.69 In addition, OHCHR received reports related to an incident in which two civilians, including a child, were killed, and five persons, including three children, were injured, as a result of what appeared to be a Palestinian rocket that fell short and hit a house in Al-Quds Street, near Khilla Gas Station, Jabalya, on 16 November. The first incident is the Mishrawi case; the second one is talking about Mahmoud Sadallah, which I also had reported at the time. Remember, the BBC had a long follow-up report where Jon Donnison pretended to address the inconsistencies I had brought up, and he dismissed them with "Most likely is that Omar died in one of the twenty bombings that the Israeli military says made up its initial wave of attacks. Omar was not a terrorist." While I would like to know the specific evidence that the OHCHR had that indicated that a Hamas rocket killed the baby Omar, the BBC's assumption that Israel must be guilty by default was clearly incorrect. Will Jon Donnison and the BBC report this? UPDATE: Some people are pointing out inconsistencies between the UN report and the Mishrawi case. The UN is wrong in saying that the child's mother died; it was actually his aunt (Jihad's sister in law.) And another relative died from injuries about ten days later as Ma'an reported. There were no incidences in Beit Zaytoun that day that were even close to this (according to PCHR), so this is the same incident.